Q. What train can travel 70 possible routes over a glacier, from 2,500 metre-high mountain tops down to near sea level, in about 20 seconds? A. An “avalanche train” in Bear Pass. An avalanche train is the sudden release of a large mass of snow or ice. Triggered by natural or human forces, it collects even more snow, ice and debris with it, as it thunders downward. In Bear Pass, a 65-kilometre stretch of Highway 37A, between Meziadin Junction and the coastal community of Stewart, there are about 70 paths where these trains can get rolling, from around mid November until early May. They stand shoulder to shoulder along the steep, sharp peaks of the glaciated Cambria Icefield of the Coast Mountains. 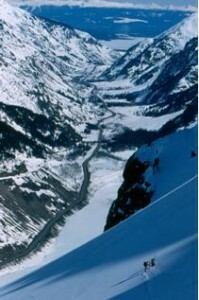 In Bear Pass, avalanches can come from both sides of the highway. To ensure travellers on the highway below, are safe from the awesome force of a massive snow slide, the Ministry of Transportation and Infrastructure’s avalanche team at Bear Pass maintains a constant vigil on conditions that contribute to increased avalanche hazards. This includes monitoring a continuous stream of weather data from six remote weather stations strategically located throughout the pass. The crew also performs tests to determine the strength and stability of the snow and what types of triggers might cause it to slide. Weather forecasts are also considered, to anticipate how wind, temperatures and precipitation may affect conditions. 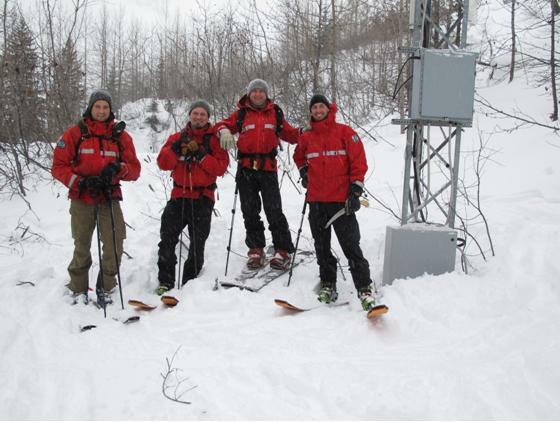 The team then combines all this information with local knowledge of how unstable snow reacts in specific types of terrain, to produce an assessment of how avalanche hazard levels might affect the highway. Team leader Ryan Boyle and assistants Shane Spencer and Ryan Foster ensure safety for those who work and travel in the pass, in an avalanche management area that’s considered one of the most challenging in the world. What makes Bear Pass exceptional beyond the 70 side-by-side avalanche paths, is the vastness of the snow slide-prone terrain, and the fact that avalanches can come from both sides of the highway. When conditions indicate that avalanche hazards threaten the highway, action must be taken. The team looks for a window of opportunity – the right time to reduce snow in a “controlled avalanche.” At that time, they close the highway to traffic, go up in a helicopter, and drop explosives that reduce the snow build-up, before it becomes unmanageable. While the avalanche crew is doing this, Billabong Road and Bridge Maintenance is outside the road closure zone, ready to clear the highway, should a mass of snow, ice and vegetation hit the valley bottom. Most avalanche control missions in Bear Pass can be performed in two to four hours, however when conditions become more severe, longer highway closures are required. During an average winter, closures total about 95 hours. For people who might be waiting on the highway for the road to open, there’s the possibility of seeing an avalanche pouring down the mountains and a mass of avalanche powder rising up, as this person did: VIDEO. We think that’s something many people would pay admission to see, but it’s courtesy of your friendly neighbourhood Bear Pass avalanche program. For the 400 or so residents of nearby Stewart, avalanche control is part of life in their spectacularly scenic locale. Many will tell you that their postal code – V0T 1W0 – stands for “Very Old Town, One Way Out.” They know to go to DriveBC, or check in at the local coffee shop, to find out what’s brewing with avalanche control. Out-of-towners will also find this information on DriveBC, the ministry’s avalanche advisory site, and Twitter @DriveBC. This winter has been a demanding one for the Bear Pass team. Northwest B.C. has been getting the most precipitation, of any place in the province – almost double last year’s amount. Due to Bear Pass’ location on the north coast at the tip of the Alaska Panhandle, there is a near constant supply of rain or snow. And when it’s not raining or snowing, the temperatures can be driven downward by strong Arctic winds. These conditions contribute to more than 700 naturally occurring and planned avalanches in the pass, each winter. And avalanches continue into the spring. Like schedulers at a train station, ministry crews at Bear Pass and around the province, work to keep travellers safe, carefully timing each avalanche train’s start, to ensure there’s no one in an avalanche’s powerful path. Avalanche crew Ryan Foster, Ryan Boyle, John Buffery and Shane Spencer on the job to keep the Highway 37A safe from avalanches.